Mirror Butterfly: the Migrant Liberation Movement Suite (MLMS) was created by an interdisciplinary, collaborative team of Ben Barson (composer), Gizelxanath Rodriguez (vocalist), Peggy Choy (choreographer), and Ruth Margraff (librettist). The team was loosely inspired by the revolutionary Zapatista myth (of Chiapas, Mexico) relating to local ecology, sustainability and rebellion—told through metaphors of a tree, a stone, and a river. The MLMS story focuses on portraits of three women, inspired by actual interviews conducted with living activist/artist women--Mama C (a former Black Panther now in Tanzania) symbolized by the Mulberry Tree, Azize Aslan (part of the Kurdish woman’s movement, a remarkable democratic, matriarchal and ecosocialist movement, fighting ISIS and Turkish repression) is symbolized by the Stoneflower. Finally, Yaqui women Reyna Lourdes Anguamea and Gizelxanath Rodriguez are both represented by the almost-extinct Kautesamai Butterfly of Sonora, Mexico. The portraits show women’s confrontation and engagement with the violent, repressive colonial occupation (symbolized by the Sword character), whose destruction of ecologies results in forced migration and climate crisis. Other characters/dancers provide depth to philosophical and environmental themes. The Snail symbolizes the Zapatista philosophy of slow, revolutionary spiral-like transformation, and the Mushrooms represent underground networks of fungal intelligence as well as the legacy of guerrilla fighters--inspired by the Underground Railroad, the Black Panthers, today’s Kurdish women fighting ISIS, and the long history of Mexican revolutionaries, including Zapatista women. The work is sung in multiple genres (opera/soul/hip hop) and multiple languages, including the Yaqui language of Yoeme, with translation into English provided by a narrator character. This multi-genre and multi-aesthetic approach is meant to communicate the diversity of migrant experiences and cultures, and fight stereotypical and destructive representations of migrants entering or living in the United States. The MLMS was premiered at the New Hazlett Theater, under the direction of Cynthia Croot, and conducted by Federico Garcia-De Castro, to open up Season 6 of the CSA (community supported art) series. It was presented in October in dialogue with Indigenous People’s Day. The piece featured a 15-piece band multicultural jazz band, three choral singers, and 7 dancer-actors including one hip-hop/spoken word artist. In this scene, Stoneflower (played by Nejma Nefertiti) receives an offering from Snail (played by Peggy Choy): the strength and wisdom to confront the Sword. Here, the mushroom dancers (Albert Du and Trevor Miles)—an underground network of resource-sharing resistance—send solidarity and healing to the Mulberry Tree (Kelsey Robinson). 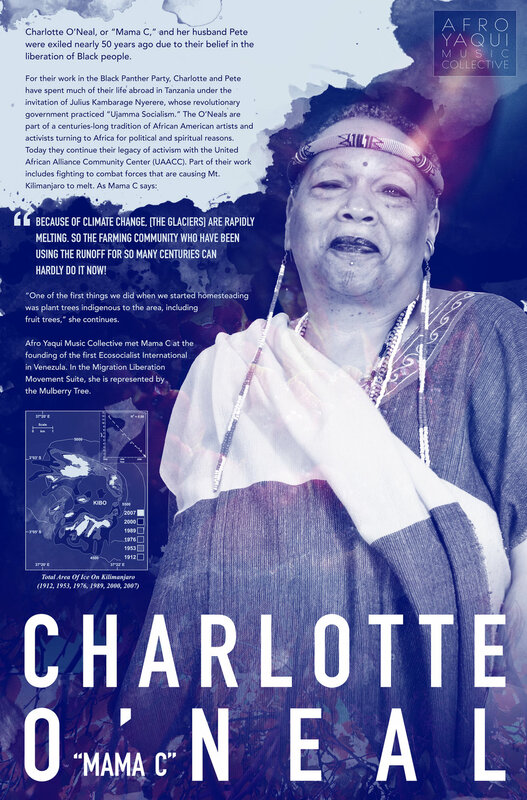 Charlotte O’Neal "Mama C” is a former Black Panther, now an ecosocialist community organizer, living in Tanzania. She is one of the living revolutionaries who provided the inspiration for the Mulberry Tree character, played by Kelsey Robinson. Read a review from our friends at Recital about the show. A Window into the Process of Building MLMS from our friends at Recital. Azize Aslan is a revolutionary Kurdish economist and part of the Free Women’s Congress. Her philosophy is symbolized by the character of the stoneflower, played by Nejma Nefertiti. WESA covered the show’s themes in a lengthy preview article here. Reyna Lourdes Anguamea is the director of El Museo de los Yaquis and an activist for the water rights of the Yaqui people. Her character is symbolized by the Kautesamei, an almost extinct butterfly sacred in Yaqui culture which contains four mirrors in its wings, played by Gizelxanath Rodriguez. The MLMS was presented by the Kennedy Center on November 23rd .